Easy to use and flexible Pass-by noise test system with hi-end DAQ hardware and powerful software capabilities for online visualization, validation, and analysis. AUTOMATED WORKFLOW: Dewesoft X sequencer offers to automate testing procedures for the test operator. Brake test module includes a pre-defined test sequence that guides the driver through the testing procedure. LIVE RESULTS: The system provides real-time online results and automated report generation. EASY CONFIGURATION: The solution provides easy software and hardware configuration of all devices and sensors. BATTERY POWERED: The entire data acquisition, processing, and sensor hardware are battery powered using our high-performance Li-ion battery packs. DIRECT SENSOR INPUTS: Data acquisition offers direct IEPE microphones, IR temperature sensors inputs. TEDS is provided for sensor autodetection and zero configuration. ADDITIONAL DATA SOURCES: Additional synchronized acquisition of other sources is possible within the same system - CAN, OBDII, J1939, FlexRay, XCP/CCP, video, weather station (air temperature, humidity, wind speed, ...), etc. 2 CM POSITION ACCURACY: The system is based on 100 Hz GPS measurement with RTK upgrade which provides positioning accuracy down to 2 cm. 0.1 KM/H VELOCITY ACCURACY: Velocity accuracy is guaranteed down to 0.1 KM/H. 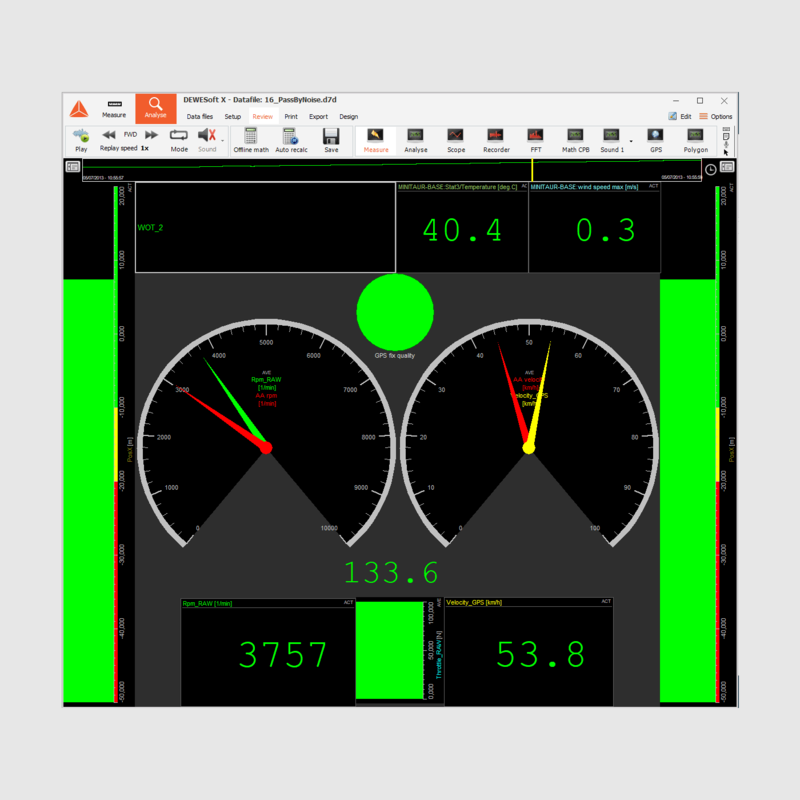 SUPPORTED STANDARDS: Software provides the calculation of CPB and sound level according to IEC61672 standard. Other analysis supported standards are ISO 362, UNECE R51.02, SAE J1470. SEVERAL APPLICATIONS: Dewesoft brake test system has built-in analysis for standard brake tests (ECE13H, FMVSS 135, etc), ABS testing, Braking comfort and the possibility to add additional test standards or maneuvers like tire test, acceleration test, handling test and/or fuel consumption tests. 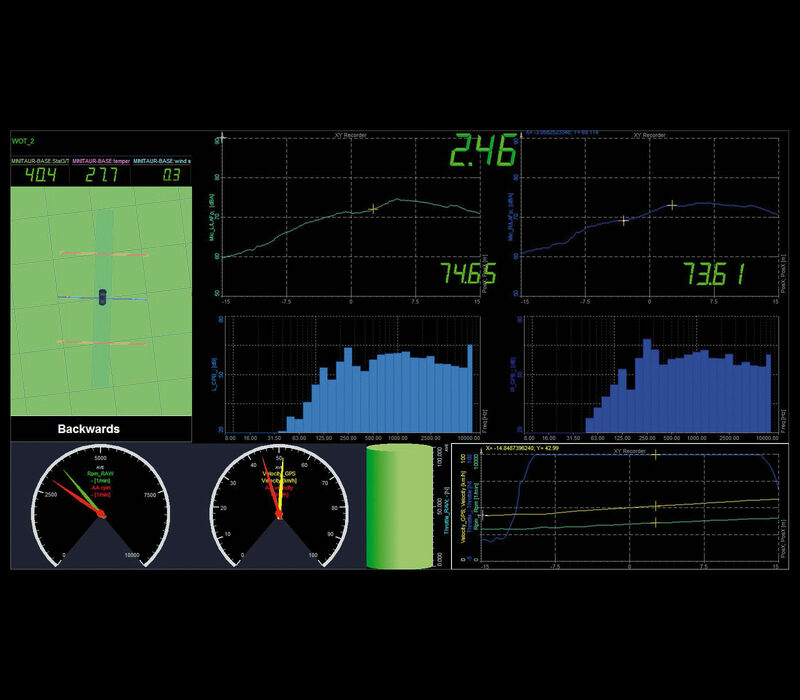 Dewesoft pass-by noise system is a flexible research & development measurement package. In addition to hardware, it contains easy-to-use and powerful Dewesoft X software for online check and validation of results. Dewesoft X sequencer can be used to define a completely custom test-sequence that will guide the driver step by step through the complete test process and provide results immediately. PPS synchronization technology and Dewesoft X NET allows the communication between different computers in Master/Slave mode. 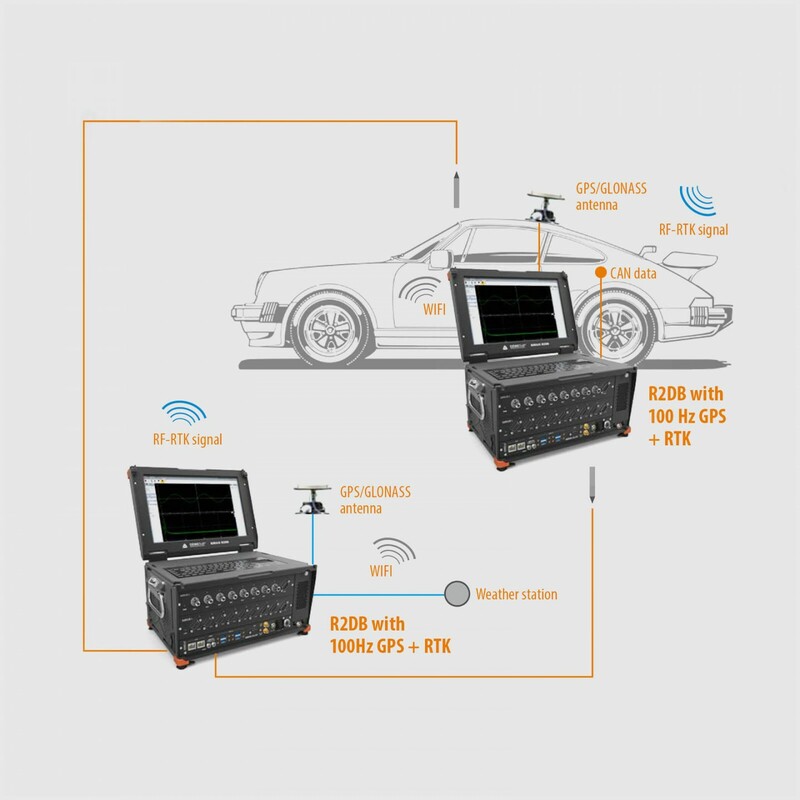 This allows the user to transfer the data from outside DAQ system (microphones, weather station, asphalt temperature, ...) to the vehicle DAQ system directly. 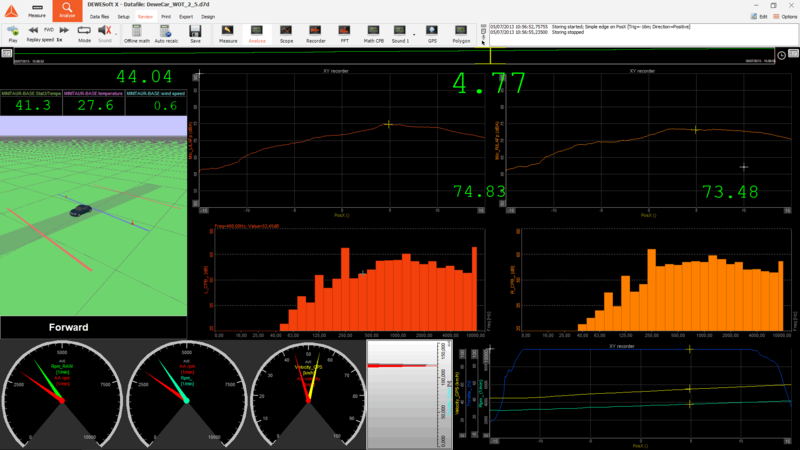 Online analysis, visualization, and validation of the data can is done in master DAQ system in the vehicle. Pass-by noise solution consists of two separate data acquisition systems. 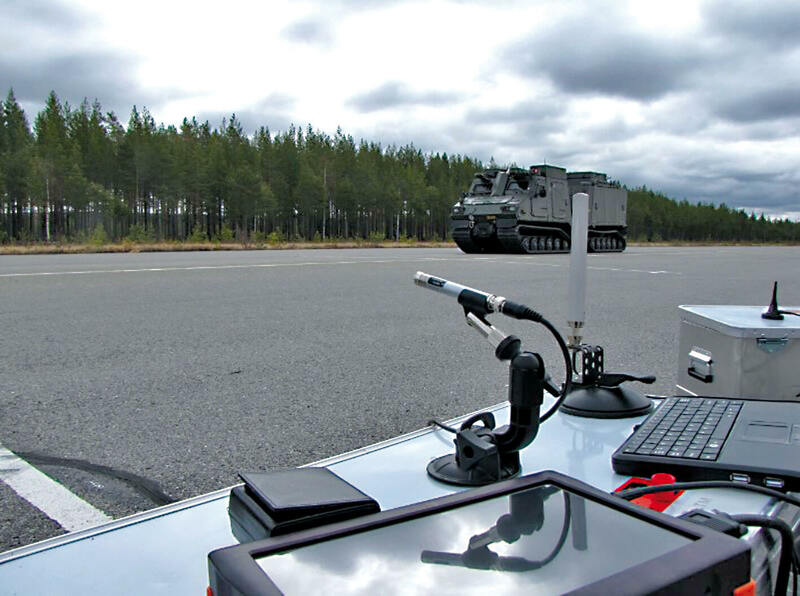 This DAQ system is placed in the vehicle under the test and offers all the processing power for storing, analyzing and visualizing results and step-by-step instructions for the driver. The master DAQ system acquires and stores all the vehicle positioning and velocity data. It can also acquire additional data from CAN bus, video, etc. This system also synchronizes and saved the data from the outside, slave DAQ system. This is the second DAQ system that is placed outside and acquired data from IEPE microphone and IR temperature sensors, asphalt temperature, and optional wind speed, air temperature and humidity. Both systems are based on R2DB data acquisition system. The most important pass-by noise parameters are calculated online so that the driver can immediately see if the test has passed or failed. This greatly reduces the time of testing and analyzing. More advanced calculations can also be performed online during the test itself. CPB, sound level, FFT analysis, and 3D polygon positioning and distance calculations. These results are vital for the analysis engineer to compare different test-runs and to immediately see the highest frequency. Additional post analysis is always possible. Post-processing features in Deweosft are completely free. The data file can be shared, viewed and analyzed on as many computers as needed without any additional software license.